My first job when I got to Upaya was to mop the kitchen floor. I hated it. Dirty water would slosh onto my legs as i lugged the heavy wheeled bucket up and down the stairs, and I worried about straining my back carrying it. I was annoyed that I wasn’t supposed to pour the dirty water down the drain, but had to to take it outside to dump on the plants. The mop end sometimes falls off and I have to screw it back on. When I was working kitchen cleanup crew I would sweep and do the toilets and everything else first, hoping someone else would do the moppin. But then I started falling in love with my mop. It’s a dangerous thing. I figured out how to carry the bucket so it doesn’t spill or hurt my back. I learned to mop in a swinging rhythm, levering the mop against my thigh and swishing it in broad figure-eights. I like the feeling of leaning into the wringer handle with my whole body weight to squeeze out the water. I even like using a razor to scrape off the bits of goo that the mop won’t lift. The red tile floor shines in the sun. Today I was training a new newbie in the kitchen-cleaning drill, and I asked him to vacuum the offices and the shelves and the wipe down the high ceiling beams.Â I saved the mopping for me. Sounds like you’re getting into the swing of things. dear, so sweet and funny to hear your news, oh, life in a zen community. reminds me of my 4 month work study at gampo abbey in 99. 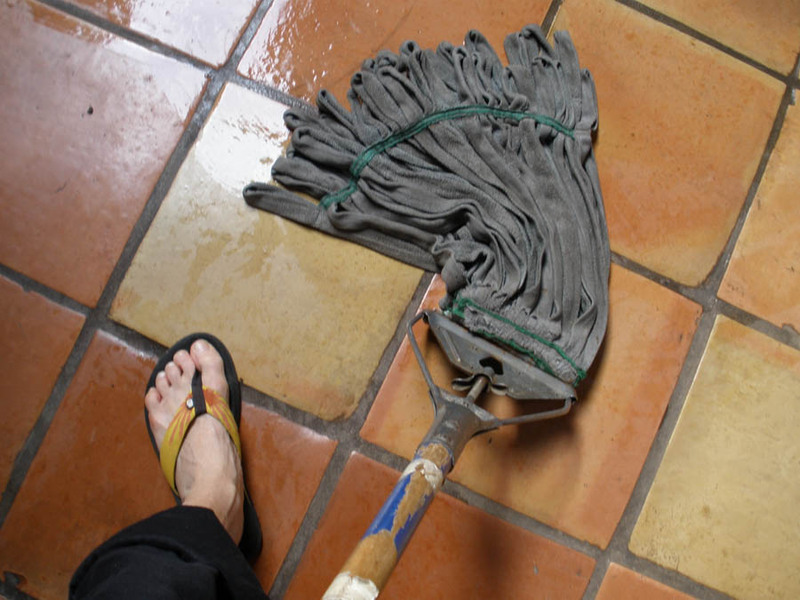 I like mopping. And I hate it. Loving the updates. Missing you! I thought of you today as I floated past your apartment, stopping to watch the crows that were stopping to watch me. I look forward to more. Will send email soon.